The Walking Dead Sword is an interesting blade that has several official and unofficial replicas currently on the market. But before we take a closer look at what is available, I think it is interesting to briefly explore the sword seen in the series. 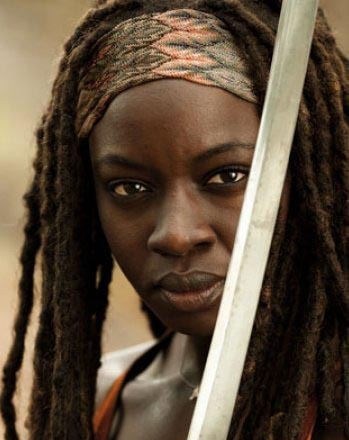 While the actual series isn't all that clear as to how and why Michonne ended up using a Katana to cut swathes through the hordes of zombies, the comic series explains that she took it from her neighbors house early on in the outbreak, for her neighbors teenage son was a sword collector..
And clearly, one of some taste, as this is no run of the mill 'ninja mall sword' - nor was it an off the shelf functional piece like we review and talk about here at SBG. 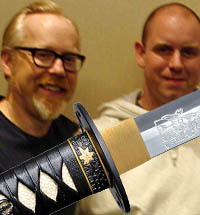 Without a doubt, it was the pride of the young mans collection - and I would speculate had been custom made for him..
What is very interesting however, is that if you look at any close up shots of the blade itself, it is lacking the distinctive hamon temper line of a traditional Japanese Katana. 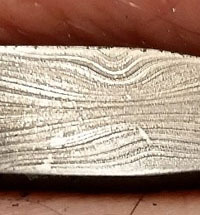 Close ups of the blade show clearly it has no hamon temper line. 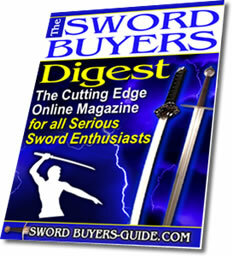 Curious about the different types of steels swords can be made from? Click here to get the lowdown on the most common types used. 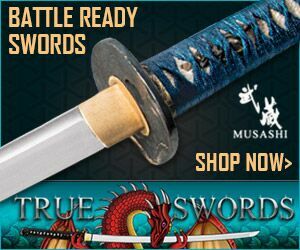 This actually makes a lot of sense, because if you are going to be using a sword frequently against undead hordes, you need and especially TOUGH blade - and as we explain on our site here, the toughest fully functional Katana these days are all monotempered - which means that they are the same hardness all the way through and will not have a hamon temper line..
As such, if I were to speculate, the blade was probably a high end custom piece made from S7 shock steel or L6 bainite or at the very least, monotempered 9260, 5160 or 1060 carbon steel. And probably cost at least several thousand dollars to commission..
Luckily the replica Walking Dead sword does not cost anywhere near that much. 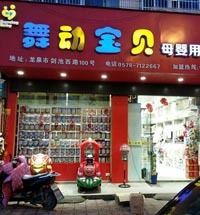 So let's take a look at what you get for your money. 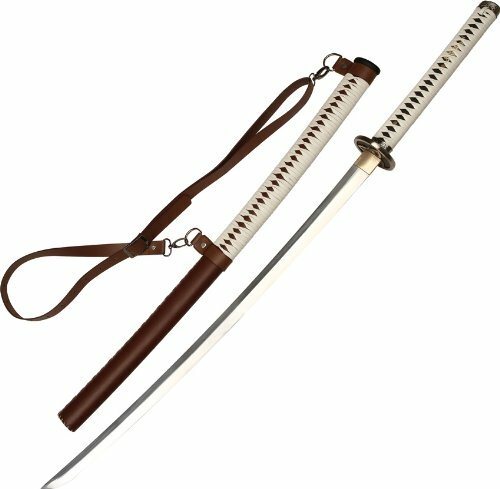 The officially licensed Walking Dead Sword replica is actually a pretty faithful recreation of the sword seen in the TV series. 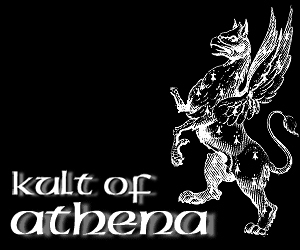 The fittings, while made from zinc alloy are a bit on the fragile side for any serious use, they are exactly the same as those seen on the original sword itself and have what appears to be a 'Celtic' theme. Though - perhaps by coincidence - also allude to the universal sign for a biohazard, with the actual biohazard symbol engraved on the blade itself (probably by Michonne during some downtime)..
Like the original, the replica comes with a back mounted sling and differs slightly from the original in that instead of a white eel skin wrap (which would be prohibitively expensive, but was chosen because it does not easily absorb gore, blood, dirt,grease, etc), it has white leather ito over the sheathe and the handle. 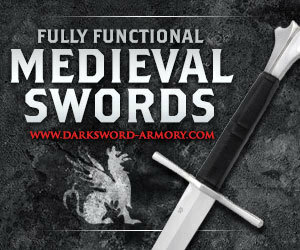 And like the original Walking Dead Sword, this blade is made from monotempered carbon steel and has no hamon temper line. 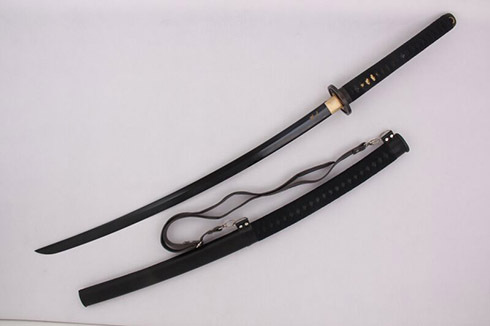 Though considering the price is between $120 to $200 depending on where you buy it, it is not S7 or L6 steel costing thousands but instead uses the most basic steel type for a functional sword - 1045 carbon steel. 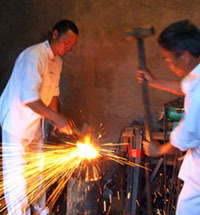 Probably the biggest disappointment with this sword is that it is unsharpened, but being made from 1045 carbon steel, it can take and keep a decent edge if so desired (click here to learn basic sword sharpening techniques and methods). 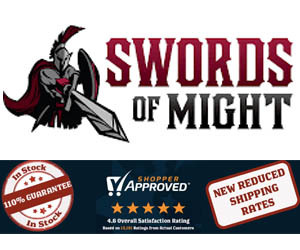 While the officially licensed sword is actually quite reasonably priced for what it is, there are a number of unofficial knock offs going around of varying degrees of quality and functionality. 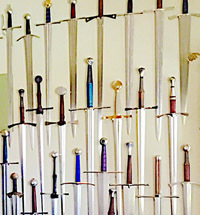 However, almost all of them have at least one or two major deviations from the original design and the official Walking Dead Sword - such as Damascus steel blade, a hamon temper line or silly mistakes like white rayskin under the white wrap instead of black rayskin as you can see clearly in the example below. An unofficial knock off with at least two glaring errors - white rayskin instead of black and a cheap,fake hamon temper line. 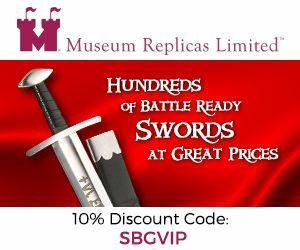 As such, because the official replica is the closest to the sword seen in the actual TV series, few if any of these knock offs are worth a second look. 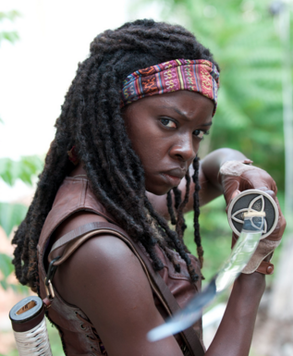 However, there is one sword inspired by the Walking Dead sword that is in a league of its own. Sword manufacturer and designer, Chris Scoggin from Ronin Katana took an original approach and created his own version of what he thought Michonnes swords SHOULD have looked like, based on his own extensive experience with fully functional sword manufacturing. Instead of a relatively short 26.5" blade, he extended it to 30" (31" if you measure it from the hand guard) while actually lowering the overall weight by around 4oz to give it some additional speed and reach, which is clearly something to be desired when facing an zombie horde. Understanding that the blade and the fittings will be frequently covered in all manner of gore, he opted for a low maintenance approach by having the blade blued (blackened) to slow down any possible issues with rust when not able to take the time to properly maintain the blade. Likewise the fittings were also blackened, as even with the stain resistant qualities of eel skin, white colored ito wrap is a really not a good idea for a sword that is going to see frequent battlefield use. And this, the Hanzo Steel Zombie Apocalypse Katana, is the end result- a fully functional, sharpened 1060 carbon steel blade that could almost work in real life like Michonnes sword in the TV series.. While at $274.99 it is around twice the price of the official Walking Dead Sword,in terms of functionality, it is several times better overall - and best mounted with a sign that says 'in case of zombie apocalypse break glass'. Just to be on the safe side.. ;-).